This is a preview of the new (second) edition of my original Healing Plan, now published by Berrydales Books. You can see the ebook and paperback on Amazon UK here. And on Amazon US here. "Three years ago Michaela Rose was in constant pain, had dropped to a size 6, could eat fewer than 20 foods, reacted to even the purest water – and had genuinely started to believe that she might starve to death. As a natural health practitioner herself, she had tried every approach – but none worked. Finally she started to look beyond her body to her own life experiences and how they had ‘programmed’ her to become chronically hypersensitive. This book follows her own healing path with detailed instructions and pointers to other helpful books, videos and groups." You can also join a special, private Facebook Group to chat with me and others in the same boat, if that would help you. Details in the book. "there is an incredible amount of knowledge and fantastically helpful information in this book. I really think this is a whopper of a piece of writing..."
Multiple sensitivity to foods, chemicals, life! "This book is truly exceptional. You should be incredibly proud." Just finished the first read-through of the Healing Plan. It feels so supportive and personal, like a kind friend who has been there, pointing out a myriad of possibilities for making my way. It helps not to feel alone with my illness. Thank you! I have spent many years as a naturopathic medical nutritionist working with people on the functional side of what may have gone wrong with them. Is it their adrenals, methylation status, a parasite, an allergy, a nutrient deficiency? And on the search usually goes. This works for many, many people, but what happens when someone has what I call an ‘unresolving chronic illness’ that just isn’t responding to normal mainstream or alternative treatment? And what if those people can’t tolerate the foods, meds or supplements to help and have ‘avoided’ so many foods (and possibly chemicals and even life!) that they are now left with an extremely restricted diet, a joyless life, a skinny backside and are still not getting better? That’s what happened to me. And that’s why I wrote this book. I had to find another way to heal myself with ‘non-ingestive’ methods – ‘nil by mouth’, as I call it. 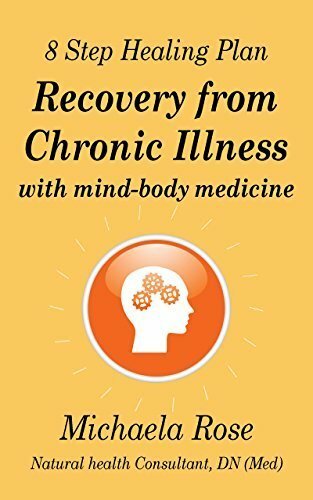 This book outlines the five key steps I took to turn my health around. It was a massive learning curve and one where I had to suspend disbelief quite a lot, but it worked. I got many foods back, recovered my energy levels, got rid of things like restless legs, chronic pain and - the best bit - I feel 'normal' again (well, as normal as a 50 year old gets..). And I know that's what you want; it shouldn't be too much to ask, should it?! My genuine hope is that this approach will help you too. To be honest, I’ll eat my hat if it doesn’t – although I can’t yet eat hats! "This will be a massive eye-opener for a lot of people...."
"Feels like you are there holding my hand so not such a lonely experience...."
"I think the book is brilliant, love the lay out and style, flow and writing. Well done you!" "I think this is a tremendous health plan that seeks to educate people about the emotional and psychological components of chronic ill health. It teaches the link between the physical and mental and will really help those people who firmly believe this does not apply to them! Just making the effort to purchase and read the Healing Plan will be a big step forward in someone’s healing and recovery." "..you have done masses of research and so will save people lots of time not having to do it themselves. They also have the benefit of you having tried and tested various methods. Well done!" "Your writing is very easy to read and the spacing etc all help make it easier too." "It really is phenomenal. I nearly wrote I felt it was better than the Gluten Plan but then changed my mind as that would be very unjust as I think the GP is fantastic too! But the HP is unique and very comprehensive in addressing a particularly difficult and sensitive topic." "I love that the book is written in your usual easy going style that incorporates some good humour... I like the way you give the reader lots of links to follow up if they wish too - their choice, which is nice." "You've given an honest insight into your own journey for others to understand and you've shared what you've learnt along the way with information on what's worked and hasn't worked for you, all in a bid to help others and I admire you for that - ultimately giving a lot of information and options for someone who wants to look further to find out what might suit or work for them in their quest to get well." "What an enormous piece of work this is. I found it a fascinating read and it was so useful to have all the links to other sites…And how generous of you to put your experiences out there for us all to benefit from…. As you point out, each person reading your book will take different things from it and really it is a wonderful idea that people can travel their own paths with the information you provide…Your book has already helped me in several ways. Firstly I know I’m not alone. That’s very powerful….as a result of reading your book I find I have a new path to follow, feel much more positive and trust things will level out now..many thanks. "I bet lots of people will cry reading this..."
The book is absolutely full of links to resources for you. I calculated I tried 47 different techniques over the two years it took me to do this. I've done all the trialling for you so you'll know what to use now and, importantly, how best to use it - I try and explain really clearly how I applied each recommended technique for best effect as we go along - so it should take you a lot less time than it did me! I so wish someone else had done this when I needed it! "There is so much information and links for further exploration. It’s an absolutely terrific one-stop shop directory for anyone who is battling with chronic ill health..."